Wisconsin Literacy, Inc. (WLI) provides leadership and a statewide voice, advocating for adult literacy as a cause worthy of support. Our advocacy efforts also highlight the work of our 76 member agencies. Literacy is often at the core of a wide array of government and social services. We work to connect to such agencies through representation on our Board of Directors, partnering on projects, and serving on state agency advisory councils. 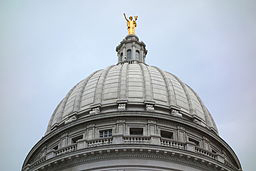 Currently, WLI is represented on the Governor's and State Superintendent's Read to Lead Development Council, a public-private partnership tasked with the goal of supporting and expanding reading and literacy programs in Wisconsin. WLI also works to connect our state and federal legislators to our member literacy agencies. Each September, during National Adult Education and Family Literacy Week, we arrange for legislators to visit their local literacy programs and learn first-hand the value of community-based literacy. WLI partners with Wisconsin Technical College System, Wisconsin Department of Public Instruction, and Wisconsin Department of Workforce Development to help streamline better prepared adult learners into further advancing their education. Our 76 member agencies work with adults and families at the lowest levels of literacy.